Once again I'm working on practice squares, trying out all the FMQ designs in the two Angela Walter's books I purchased, Shape by Shape and Free Motion Quilting. Last time I used designs from her Shape by Shape book. You can see those results here: in this post (Scroll down to the end). 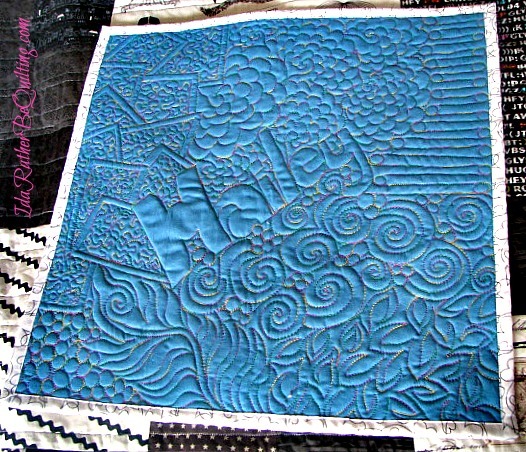 This time I worked from her first book, Free Motion Quilting with Angela Walters. I think I have a slight preference for her second book mostly because I love the structure and organization of it. But this book has some great designs as well. Here is my finished practice square. As before, this practice square will double as an older sibling gift for an upcoming baby shower. This time I outline stitched the entire name instead of just an initial. Then I started on the left of the 'H' with those great funky filled in squares. I love these squares!! They are so fun and easy to sew. Next I tackled the flowers, which I have always wanted to do and never been able to figure out how. Angela's diagrams and instructions were so easy to follow that I was able to fill a big space with various size flowers without even having to plan it out much. The pulleys were also really fun although I did have to think about putting the end pulley at least a 1/4 inch in from the edge so the binding wouldn't cut it off. Next I tried some swirls and pebbles, which I have done before. And an all over leaf pattern which I haven't. I think I still need work on that one. Maybe some pen and paper time as well. Then I finished with what Angela called a fern feather and some pebbles in the corner. I used a Superior King Tut thread again that was fabulous! I love how the variegated colors show up on this solid background. The black and white binding was left over from another project and made this a quick and simple finish. I learn something every time I do one of these practice squares/mini quilts. It is so much easier to master the motion of a design when you aren't fighting the weight and drag of a larger quilt, even a baby quilt. I have three more of these made up and ready to go. And I haven't tried all the designs in these wonderful books yet. So thanks for stopping by today and stay tuned for more! Looks great. I haven't branched out to try the Superior threads yet. Any advice? I really love Angela's description of the flowers; they have been one of my recent finds and fun new quilting designs to use, too! Your "practice" quilting is great! King Tut is my favorite quilting thread, but I haven't tried a variegated one, yet. I like how it looks in your project. Looks fabulous! I need to sit down and practice some of these as well. I love her books! Wonderful quilting! There is a real flow to the whole piece, and it is lovely present for an older child when a new baby arrives. Hi Ida, those minis great ideas for practicing. Well done! I also enjoy Angela's books and videos on Craftsy.